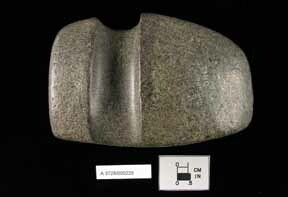 Large ground stone axe has a wide, deep groove near the poll end that extends from the flat base around the sides and top, which functioned to attach the axe head to a handle. The base is flat. Opposite end tapers to a thin, wide cutting edge. The surface of the igneous rock is very dark gray and light olive gray and is very highly polished. Item was found in Hamilton County, Ohio. By archaeologist's distinctions, Ohio's so-called "Archaic people" ground and polished hard stones such as granite into a variety of durable tools. Cobbles of granite, gabbro, diorite, gneiss, porphyry, and slate could be found in glacial outwash along most Ohio streams and rivers. When making a tool, the stoneworker first chose a cobble of the right size and weight. He or she then shaped the tool by striking the cobble many times with a hammerstone. Finally, the tool was smoothed using objects with rough surfaces, much as a carpenter uses sandpaper. With this method the toolmaker was able to make a polished axe, adz, or chisel for woodworking, a pestle for grinding nuts, or an ornament to wear. The axe pictured here is especially large and fine. It is more than six inches long.